Once I thought about the renderings I did last night I realized the missing details were bugging me, so I decided to update it with the missing bits. It looks more finished to my eye now, although there are a number of things that I’d still want to tweak. This is close enough for my purposes, and was a good experience getting familiar with SolidWorks 2011 — I had been using the 2009 version because of some other limitations. So, what’s new in this version? I added a simple base. It’s a small detail, but I think it makes it look a lot more finished. I changed the top so that it has breadboard ends with ebony plugs, and I added the same stylized inlay as on the front panel (silver wire with copper accents and abalone shell inlay. I had to fiddle around to figure out how to get the abalone inlay to render, but I got it sorted out. 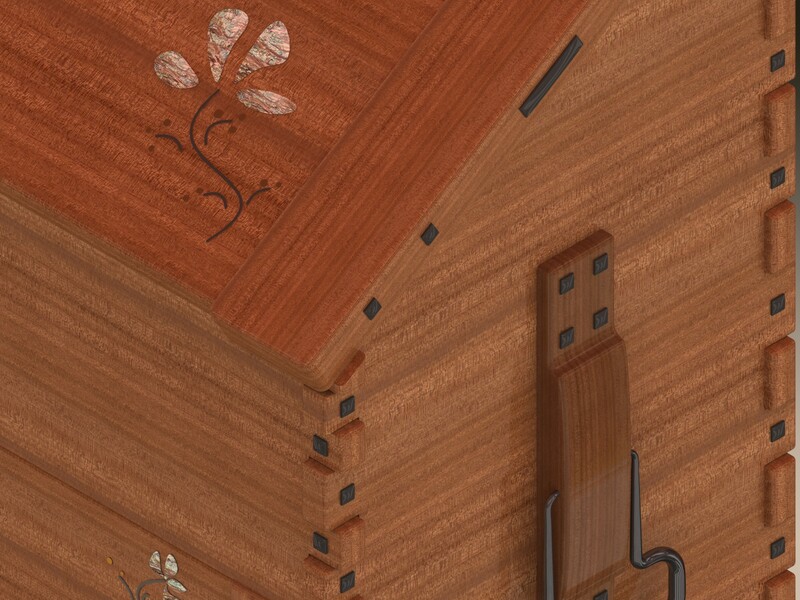 I also added handles on the sides for carrying, in the same style as the Bush Curio Cabinet, more or less. It looks finished now, although if I build it one day I’ll need to spend more time futzing with the inlay design, and maybe a few other details. There is a G&G Inlay class at the William Ng school this spring, I’d really like to attend that. I’d better start saving my pennies. This looks like it’s missing a G/G stand of some kind. I’ve been thinking of a new tool cabinet and this would do if it was on a base up off the deck. Yep, a base would be a logical addition. 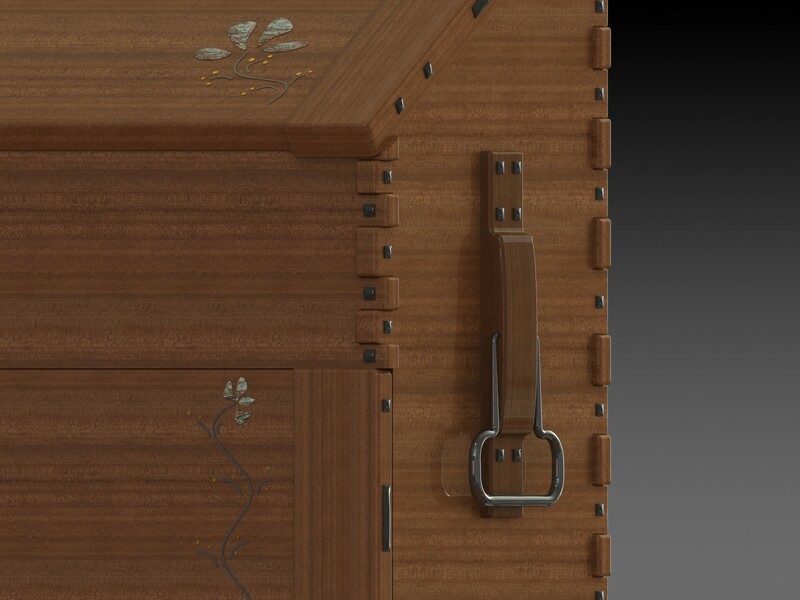 I was thinking of doing a “campaign furniture” version of a Dutch tool chest just for fun (it’s not really my aesthetic) and making a fold up base out of Mahogany and leather straps similar to a roorkee chair. It would probably end up looking similar to this fold up stands waiters use in restaurants when they are serving food (although it would break down further). That’s bad. You got it right on. What’s the measurements going to be. What’s the base wood. Thanks! It would need to be made in Mahogany I think, probably with a slightly darker, slightly redder finish. The handles and inlay lines are silver. 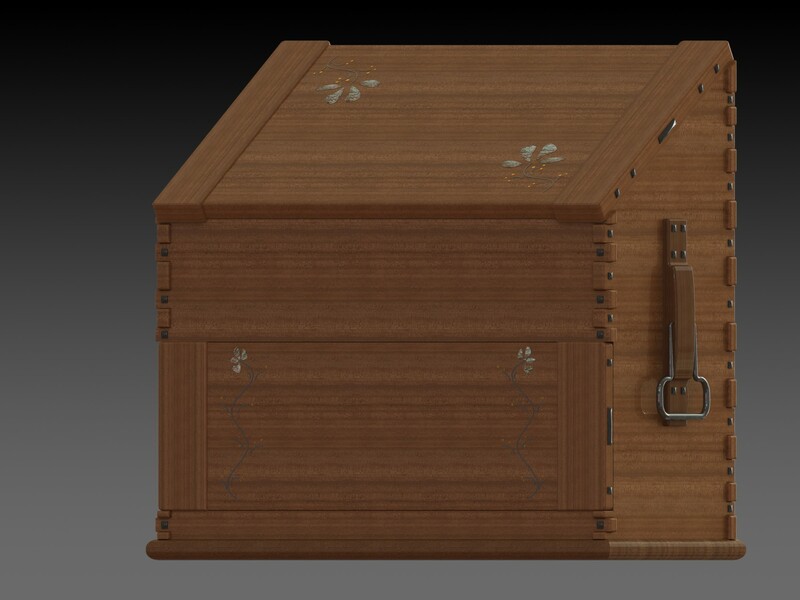 It’s sized exactly like the small dutch chest in PWW, 27″ wide, 13″ deep, and 24″ tall at the top.